The need to understand and quantify change is fundamental throughout the environmental sciences. This might involve describing past variation, understanding the mechanisms underlying observed changes, making projections of possible future change, or monitoring the effect of intervening in some environmental system. This book provides an overview of modern statistical techniques that may be relevant in problems of this nature. Practitioners studying environmental change will be familiar with many classical statistical procedures for the detection and estimation of trends. However, the ever increasing capacity to collect and process vast amounts of environmental information has led to growing awareness that such procedures are limited in the insights that they can deliver. At the same time, significant developments in statistical methodology have often been widely dispersed in the statistical literature and have therefore received limited exposure in the environmental science community. This book aims to provide a thorough but accessible review of these developments. It is split into two parts: the first provides an introduction to this area and the second part presents a collection of case studies illustrating the practical application of modern statistical approaches to the analysis of trends in real studies. Presents a thorough introduction to the practical application and methodology of trend analysis in environmental science. Explores non-parametric estimation and testing as well as parametric techniques. Methods are illustrated using case studies from a variety of environmental application areas. Looks at trends in all aspects of a process including mean, percentiles and extremes. Supported by an accompanying website featuring datasets and R code. The book is designed to be accessible to readers with some basic statistical training, but also contains sufficient detail to serve as a reference for practising statisticians. It will therefore be of use to postgraduate students and researchers both in the environmental sciences and in statistics. Researcher in the area of stochastic processes and time series, with specific applications in hydrology and climate modeling. Work previously published by Wiley in the Encyclopaedia of Biostatistics. Marian Scott is the editor of the Earth & Environmental Sciences section of Statistics in Practice for Wiley. She has 49 published articles. Her reputation within the community is evidenced by her associate editorship for 2 external journals (Radiocarbon and the Journal of Environmental Radioactivity); she is also honorary secretary for the Royal Statistical Society's Environmental Statistics Study Group. 1.1 What is a trend? 1.5 Scope of the book. 3 Parametric modelling - deterministic trends. 3.6 Inference with small samples. 4.1 An introduction to nonparametric regression. 4.3 Other nonparametric estimation techniques. 5.1 Stationary time series models and their properties. 5.2 Trend removal via differencing. 5.4 Models for irregularly spaced series. 5.5 State space and structural models. 7.2 Additive models with correlated errors. 7.3 Models for the SO2 data. 8 Rainfall trends in southwest Western Australia (Richard E. Chandler, Bryson C. Bates and Stephen P. Charles). 8.3 Data used in the study. 9 Estimation of Common tends for tropical index series (Alain F. Zuur, Elena N. Ieno, Christina Mazziotti, Giuseppe Montanari, Attilio Rinaldi and Carla Rita Ferrari). 9.3 Common trends and additive modelling. 9.4 Dynamic factor analysis to estimate common trends. 10 A Space-time study on forest health (Thomas Kneib and Ludwig Fahrmeir). 10.1 Forest health: survey and data. 10.2 Regression models for longitudinal data with ordinal responses. 10.4 Spatiotemporal modelling and analysis of forest health data. 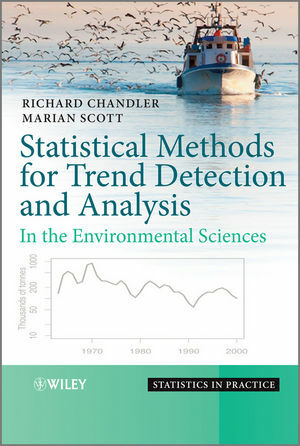 Statistical Methods for Trend Detection and Analysis in the Environmental Sciences Visit the companion website to access the datasets and accompanying R code.